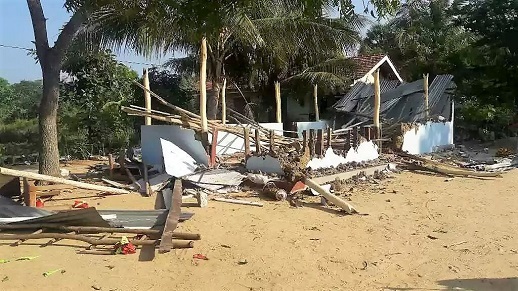 The Kithu Sevana prayer centre was destroyed by a mob on 5 January, 2017. The leader of a Sri Lankan church destroyed by a mob earlier this month has vowed that the church will continue to meet. Kamal Wasantha, leader of the Kithu Sevana prayer centre, told Asia News, “No attack can stop us. We shall continue to meet and pray under a tree”. Despite the attack leaving the Christian community of 15 families and 20 other worshippers nowhere to meet, they have no desire for revenge. “[We] shall not attack them in retaliation. Judgement belongs to God,” Wasantha said. On 5 January a group of people, allegedly led by a Buddhist monk, attacked the church in Paharaiya, north-western Sri Lanka. Reports vary on the size of the mob. A local source reported that it was up to 200 people. “First they threatened us verbally,” Wasantha said. “Then they came with wooden sticks, iron bars and knives and destroyed everything.” People “begged the attackers not to damage the place of worship”, he said. Palitha and another pastor, Adrian DeVisser, helped lead the church each Friday and Sunday morning. They said an incident on 1 January had made them wary: a Buddhist monk from Gothamiramaya reportedly threatened them with “serious punishment” if they continued to lead worship at the church. They filed a complaint with the police and warned others in the Christian community. On 5 January Palitha, DeVisser and the monk were summoned to the police station. The attack happened the same night. About 200 witnesses named the monk and 12 other people as the attackers. The accused remain free on bail. The church was growing quickly and, with all its members being from other faiths, this attracted the attention of the attackers. Wasantha, himself a Buddhist convert, said he “cannot abandon [his] mission just because of the attacks”. He added that there are people in the village who do not tolerate Buddhists changing their religion to Christianity. Sri Lanka is 45th on the Open Doors 2017 World Watch List of the 50 countries globally where Christians are most under pressure for their faith. The charity says “Buddhist monks, who are influential in Sri Lankan villages, are the main source of persecution for Christians”.